“Look! There stands Jackson like a stone wall! He looks really refreshed….” You never know what you will find on Facebook. Earlier today while performing my morning ritual, I came across this little gym. I’m not sure about the history involved, such as Jackson’s practice of giving his men sugar and periodic rests. I would venture to say that sugar might have been in short supply in the Confederate Army. I invite anyone to prove me wrong on that tidbit. 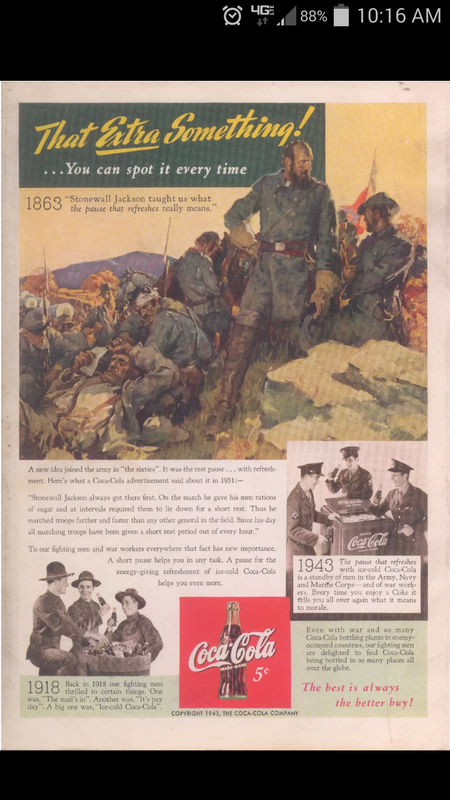 I do think it is interesting that Coca-Cola used the old Confederate war hero with the United States military to promote their product. Not only that, but the company gave “Stonewall” the front and center portion of the add. I wonder if Coca-Cola used anymore ads which featured Confederate, or Union Generals for promotion. A cursory Google search yielded no results. I guess this is further proof that the Civil War has been engrained in the commercial pop-culture of the United States….for some time. Previous And the White House Burned, Burned, Burned…. Bill Mauldin naturally had a somewhat different perspective. As a collector of Coca-Cola memorabilia since 1984, the Jackson ad was from the back of a 1943 Life Magazine. That was to my knowledge the only time a Confederate General was used in promoting Coke. However, the inventor of Coca Cola – John Stith Pemberton was a Confederate Lt Colonel, and his likeness has been used numerous times. The current location of the “World of Coca-Cola in Atlanta is located in a location named “Pemberton Place” and Pemberton’s grave in Linwood Cemetery Columbus, Ga. carries the Masonic symbol with crossed CBFs. Coca-Cola issued a facsimile $100 Confederate bill featuring a vignette of a side profile of a lady in the center circa 1915. The reverse of this bill pictures a bottle in the left-hand corner and the text: “Drink / Coca-Cola / Delicious – Refreshing / Call for It by Full Name / Accept No Imitations.” Around 1920, a similar promotion was done using a $500 Confederate bill with a vignette on the left featuring a mounted ride in a circular medallion inside a Confederate flag. The bottle pictured on the reverse is the familiar bottle used from the 1920s through the 1970s. The back text is identical to the 1915 promotion. The third bill is a $100 State of Georgia note with this addition to the back text: “Souvenir of U.C.V. Reunion / Montgomery, Ala, June 2nd to 5th, 1931. Coca-Cola has made commemorative bottles without any Confederate imagery, but were a shout out for something “Confederate” like in 1985 for the Andersonville 10th Annual Historic Fair , and for the Stone Mountain Park 40th Anniversary in 1998. Coca-Cola’s ‘Sprite’ brand was chosen to help push the effort, and on the bottom of select 7-oz. and 10-oz. returnable bottles are embossed locations like Gettysburg National Military Park, Ft. Sumter National Park, Shiloh National Military Park, and Chickamauga National Military Park. Our park archaeologist here at Hawaii Volcanoes National Park has one of the Sprite bottles with our park’s location embossed on the bottom, and is seeking more information about Coke/Sprite’s involvement with “Operation Golden Eagle.” We found reference your articleBearden, Billy 1998 “Sprite Made an Effort to Promote Beautification of National Parks with 1966 Bottle Promotion.” Soda Pop Dreams Magazine 1(5):13-14. Unfortunately we have been unable to access it online. We get a “server cannot be found” message. Would it be possible for you to email ma a pdf of that article? Or other information that you have on this program? Thank you for your help.